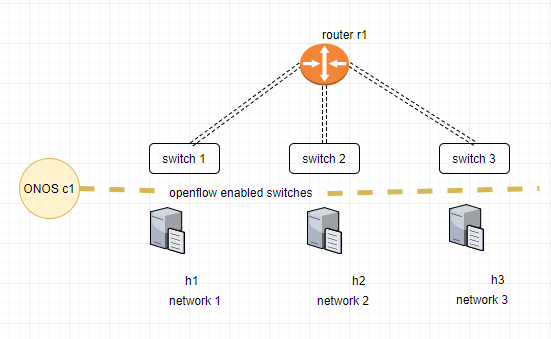 As we have progressed through learning SDN essentials by installing ONOS and testing out a simple network topology with one switch and two hosts .Now its time to take it to another level by adding a routing in between . Note we wont be using any real simulated router in between for this setup as the intention here is to test the network topology with a router in between .Ip forwarding functionality in linux which is our base server for mininet and ONOS will be used for the routing purpose. The initial setup and configuration involves creating a python code to create the required topology. as 'defaultRoute' parameters for the host interfaces. 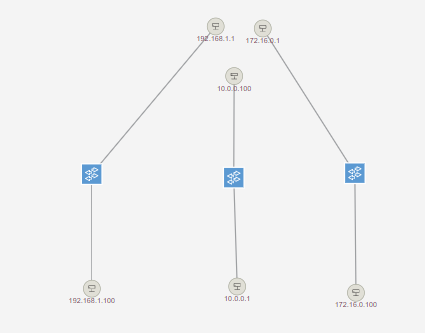 executing 'ip route' or 'route' commands on the router or hosts. "A LinuxRouter connecting three IP subnets"
Running the python code will execute all the steps and create the above mentioned topology . We have mentioned our ONOS controller installed in the same server as controller to the code. From the devices view we will be able to see the configured three switch and its details. To view the hosts attached to the switches click on the host view section. After the configuration all the hosts will be reachable to each other . PING 172.16.0.100 (172.16.0.100) 56(84) bytes of data. Note the time delay for the first packet ,this is the time required to contact SDN controller and get the enforced flows after doing this step for the first packet flow will be populated in all sdn enabled switches and there is no need to contact controller any more further communication will happen directly . We will continue doing further test by enabling a python webserver from h1 and accessing it through other hosts . This tutorial has demonstrated how easy is to setup a custom topology in mininet and connecting the same to ONOS controller. Nginx reverse proxy has been configured and service is running after the successful configuration of nginx.You might get a “Bad Gateway error “ .if we try to connect to nginx using web browser.This means packets are hitting nginx reverse proxy file ,but since our backend server is not initialized and started yet it is giving a gateway error. Here we will configure a node.js application as an app server for our testing.The application is simple and it will be listening on port 7555 for any incoming connections and will show a dialog box to create a new user, And when we click on “Create User”,a new user will be created in the mysql server which we will be using as a backend service. Configure the knexfile.js appropriately to connect to the database. Installing and configuring mysql server. Create an instance in google cloud. We check the DB server we can see the user got added. The intent of this tutorial is getting comfortable with the app dependency flows of modern applications in the cloud and how to migrate flawlessly to the latest container based and serverless technologies. Application has always been the focal point in the enterprise datacenter.Even with all latest trending technologies which are gaining prominence on a daily basis , the end result expected is same from all tools and platforms.Building the better application and augment business strategies. Three tier app model has been around for long and it has server application really well. In this tutorial as part of stage -1. Infrastructure setup has nginx configured as a reverse proxy,node.js application which will serve as an app server and a MySQL database server. Data flow happens like this. [Nginx(Ubuntu 16.04) —>node.js (Ubuntu 16.04)—>mysql(Ubuntu 16.04)]. Entire setup will run on Google Cloud Compute Engine.Create web server ubuntu vm using google cloud management interface. or using a simple gcloud command line. Sep 23 11:30:28 webserver systemd: Started A high-performance web server and a reverse proxy server. Create a simlink to /etc/nginx/sites-enabled .This will make nginx refer the configuration file and forwards the traffic accordingly.